Properties in Trössing average 4.7 out of 5 stars. Upon arrival, we were stunned. The pictures really don't capture the wonderful sights and the beauty of the house. It was spotless, so very clean and every detail had been thought of. We loved the wood oven and actually used it to cook on during colder evenings. The house view is amazing and it stretches all over the valley. There are only a few houses around, the rest is vineyard. However, you are still close to supermarkets, Straden village (walking distance) and wonderful nature. Also, you can easily do day trips to Hungary and Slovenia. And then, when you get back home, you sit down in the relaxing chairs, enjoy the sights while drinking a great bottle of wine out of your own wine cellar. It is paradise!! 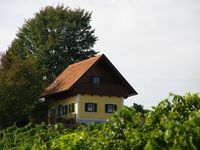 IThe incredibly friendly and hospitable Ingrid and Franz have created a truly wonderful vacation spot where everyone can relax and enjoy Austria's finest. Compliments to our hosts and we really hope to see you again!